Greed and Fear: Analysis of Emerging Markets: in the beginning of a crisis? Analysis of Emerging Markets: in the beginning of a crisis? Are we already in a crisis of emerging markets? The slow but sure rise in the dollar plays a decisive role in this. Being reinforced in recent months, has been generating various collateral effects in emerging countries. Let's see it in parts. As a preamble, this graph shows us a comparison of the different investment instruments and commodities since 2015. The emerging markets are followed by the etf EEM, in gray. The graph is a comparison between the various investment and commodity instruments since 2015. As you can see, this situation of falling in the emerging markets is not new (20% drop from it last peak in January). Recently it happened in 2015 when a greater concern about the market disturbances promoted by China gave way to a comforting restoration of capital flows, higher prices of assets and a much more favorable operating environment for emerging countries since 2016. 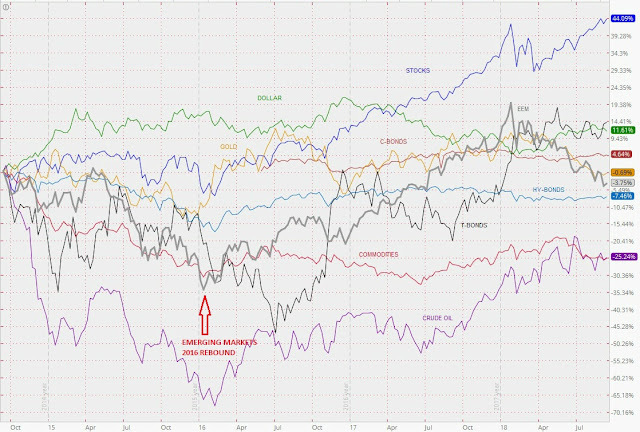 Since that year, EEM index (and general all the world stock exchanges) walked parallel with the US stocks represented by SPX, the SP500 index. It is from March 2018, when comes the first news of the tariff that Trump plans to apply to imports of steel and aluminum, that the divergence in the graph begins as seen in the following, taken from the Wall Street Journal. 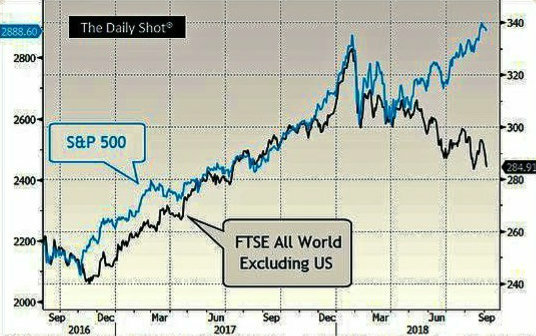 The American stock market, too solid, almost ignores this and all subsequent events in this Trade War and moves unperturbed towards new maxima. clearly diverge from March, date of beginning of the "Trade War". - Depreciate the local currency, the pair against the dollar loses, and forces the country to strong debt issues (happily even cheap for the low i-rate) that limit their reserves. It happened recently with Argentina. - Increase the external debt. Luckily, the global interest rates are still low, making the debts somewhat more manageable for local central banks, but be careful: this is already changing after several years of cooling economies by the big powers. - Depreciate commodities, whose prices move inversely proportional to the dollar. Although this helps the exporter in the short term, in the medium term it discourages investment. - The rise in US interest rates seems to continue, which will further strengthen the dollar in detriment of the most vulnerable economies by increasing market volatility. And every time the FED raises its i-rate, the capitals are going to the USA, raising its price in the emergent country and depreciating its currency. - The oil comes in raising its price all year. This is an inflation generator par excellence. Only the emerging BRICS countries and the OPEC oil exporting countries will benefit from this situation. - Trump's trade war with China, increasingly aggressive on both sides, which in turn replicates by contagion in emerging economies ('when China sneezes, the world catches a cold'). A collateral effect occurred at the beginning of last month when applying US tariffs to Turkish imports, albeit a smaller economy. The fall of the Turkish lira was spectacular, and immediately contagion arrived in Argentina. The blow to the Argentine peso was brutal, because it is a very indebted country. President Macri had to raise the interest rate to an irrational 60% (today the highest in the world) to stimulate the purchase of pesos. The result is still unforeseen. I found a good article by Kenneth Rapoza on the latest report on emerging markets prepared by Moody's. I believe that the evolution of the situation of the EEM can be understood according to what the private sector does in these countries. In summary he says that the credit quality of sovereign bonds in emerging markets shows a 'limited vulnerability' to the exposure of non-financial companies to higher borrowing costs. In other words, if companies in the emerging country have to pay more for credit in dollars, that does not mean that their government -a bond market much larger and more important than the corporate sector- will have difficulties making payments. "However, that does not mean that it is not a factor. Corporate leverage has increased in the last 10 years, as companies globally took advantage of low borrowing costs. As financing conditions tighten and risk premiums increase in some markets, financial stress in the corporate sector has the potential to weigh on the quality of sovereign credit. For now, most countries are fine. The risk to sovereign solvency is limited by economic, fiscal, capital and external reserves." The fall in recent months in the BVL Lima Stock Exchange, as an emergent economy, is directly related to all those factors mentioned above. The global low price of the main commodities that make up the BVL (copper, gold and silver) due to the Trade War, lowers its index, despite the correct economic performance of the country (the political problems are usual and does not affect the development of the stock market). No mystery here, all very clear, in a eminently mining bias exchange: it will bounce when the international prices of these metals do. So, we already in a crisis of emerging markets? I think not yet, but we can be on the way to it. 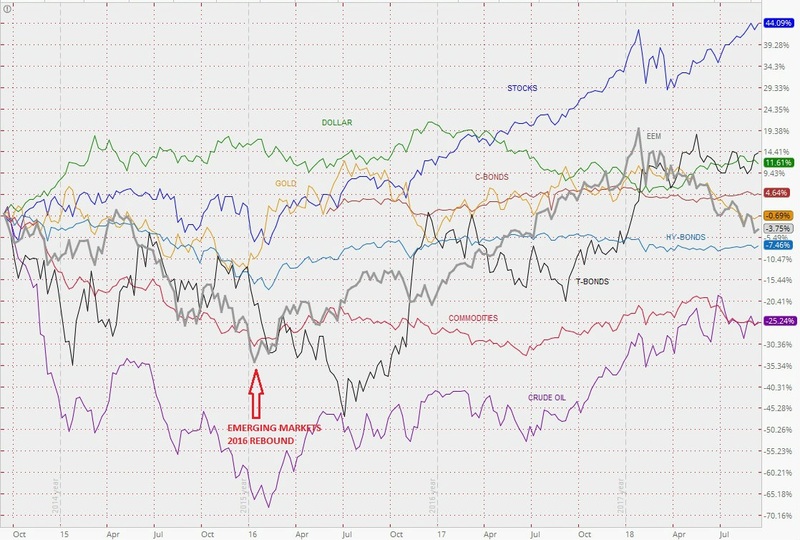 At the moment the main world index markets, all China, Japan, Germany, France and the United Kingdom, move below the SMA 50 and 200 averages, which we know, technically, are important bounce points. While, the US Stock Market are an island apart sailing in all time highs. This may be a good sign for the EEM, as well as a recent slight rebound to lows in exchange rates. These positive developments arouse the hope that we are repeating in early 2016. These slight improvements do not mean the end of the problem. Countries like Turkey, Argentina and South Africa will have to solve their economies to avoid contagion in their regions. It is also necessary to see the reaction of investors in portfolios of emerging countries. Next months are decisive for the EEM: world political and economic news will define their future behavior.